Redes da Maré, the Southbank Centre and the British Council came together to organize the Women of the World Festival – Rio de Janeiro, the first edition of the Women of the World Festival (WOW) in Latin America, which took place between November 16 and 18 at the Museum of Tomorrow, the Museum of Art of Rio and Armazém 01 – Píer Mauá, at Praça Mauá. Automatica was responsible for producing the event Women in Dialogue, which was intended to stimulate, document and disseminate reflections on the stories of women from different fields of knowledge, celebrating their achievements and highlighting the challenges that still form part of their lives. 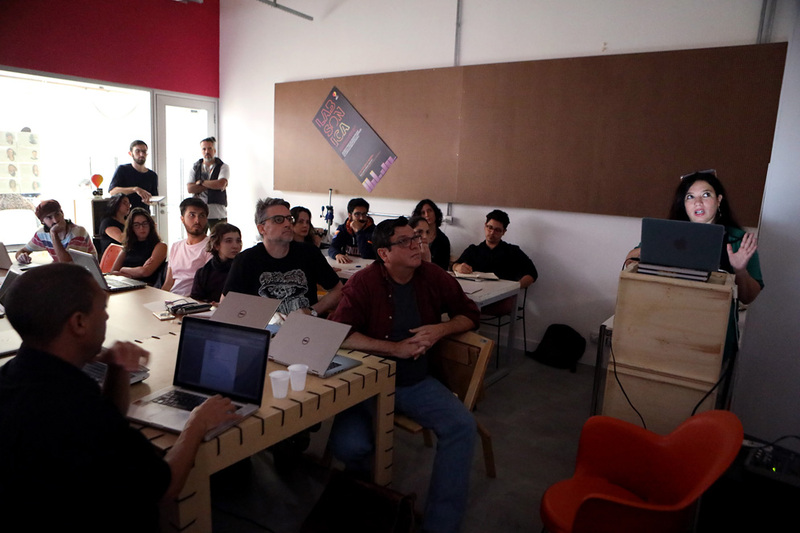 The program was devised through collective curatorship which included the staging of six Reflection Groups in different regions of Rio de Janeiro, between November 2017 and September 2018. This content was systematized and resulted in eighty activities, divided into the following formats: Shared Territories, Conversation Circles, Forums of Experience, Exchanges of Experience, WOW Bites: sharing stories, Workshops and Mentorships: lives in connection – the latter with Luiza Mello as one of the guest participants. The global movement launched by the British director and producer Jude Kelly, in 2010 has already taken place in 23 countries of Europe, Asia and Africa, as well as several cities in England. WOW is the largest, most comprehensive and most important festival dedicated to presenting work produced by women, debating and promoting the search for gender equality. Mufa Caos is a collection of works produced by the artist, Barrão, over the last three years. Comprising 34 works, including multi-coloured ceramic sculptures and monochromatic resin pieces, this series of watercolours and sculptural objects has been brought together for the first time to illustrate the complexity and subtlety of his artistic practice, which began in the 1980s. “Mufa Caos is chaotic thought and organization, technique and improvisation; it is irony and seriousness, heart and mind; it is you and I in the fantastical universe of Barrão”, explains the curator of the exhibition, Luiza Mello. There is no hierarchical or chronological logic to the construction of the works on display or in relation to the elements that compose it: a ceramic potato acquired from a street vendor is given no less prominence than a piece bought in an antiques shop. This approach, adopted by the artist in his studio, dissolves hierarchy in a time of simultaneousness. While he waits for the ceramic pieces to dry, and which take longer to make, for example, the artist works on watercolours. During the preparation of a mould for a resin piece, he explores the materials which might form a new sculpture. These are the continuous experimental exercises that follow a method, both rigorous and subversive, which are on display in Mufa Caos. The exhibition Cuttings from Contemporary Brazilian Art brings together visual artists from different generations, grouped around the themes of Afro-Rio, Colour and History/Knowledge. Afro-Rio is characterized by works that address aspects of European colonization and African inheritance in Carioca culture, produced by the artists Arjan Martins, Maxwell Alexandre and Adriana Varejão. Historically, in Brazil, it has always been possible to observe a vast diversity of chromatic projects which operate in the political and sensitive fields. Colour appears as a founding element in the works of the four artists selected: Beatriz Milhazes, Eduardo Sued, Luiz Zerbini and Miguel Rio Branco. In History/Knowledge, the artists Otavio Schipper and Daniel Lannes place art, knowledge and history in dialogue with each other, using different approaches. The three centres of the show were organized with the intention of stimulating readings and reflections on aspects of Brazilian art together with the audience of Art Berlin. The curators are Paulo Herkenhoff and Luiza Mello. The central focus of Mostra Bug was an immersion in the universe of new digital narratives, still little known and explored in Brazil. Under the curatorship of André Paz, Julia Salles and Arnau Grifeu, researchers and organizers of interactive projects, the show combined an exhibition with an international conference and workshops. During the exhibition, around 50 interactive immersive narratives were presented in the form of web-documentaries, projections, interactive documentaries, 360 videos, virtual reality animations, augmented reality, sound maps and transmedia projections [projection, interaction station + cell phone]. The curators sought to offer a panorama of the principal international creative centres and the production of the Brazilian scene, with a focus on non-fiction, and adopting an anthropological approach. The works included an inventory of sounds from the historic cities of the state of Minas Gerais – a multi-platform project created by the documentary makers, Marina Thomé and Márcia Mansur. Mostra Bug emerged from networking, research and support for new projects provided, over three years, by the laboratory Bug404 (bug404.net), in partnership with Automatica and with funding from Oi Futuro. The Belo Jardim Residence is an annual project organized by the Conceição Moura Institute, under the curatorship of Cristiana Tejo and Kiki Mazzucchelli, and produced by Automática. The Residency invites one artist each year to submit proposals which engage with the cultural, economic, political and social dynamics of the agreste semi-arid region of Pernambuco. In 2018, the Belo Jardim project resumed with the participation of the artist, Carlos Mélo (Riacho das Almas, PE, 1969). The project developed by Carlos Mélo focused on the quilombola fugitive slave community of Barro Branco, and its struggle for official recognition of ownership of the territory where it has been established for years, on the outskirts of Belo Jardim. The artist’s immersion in the locale shaped the production of the medium-length film Barro Oco, produced from a sensitive perspective of the community as a generator of processes for recovering subjectivity. In addition to the audiovisual work, the artist inaugurated the Espaço Oco, inside the Fábrica Mariola factory – a cultural space associated with the Conceição Moura Institute. During the period of the residency, the Espaço Oco functioned as a centre for promoting discussions and contact with the people of the city, stimulated by events and performances by the artist and guests. With the aim of contextualizing the work of Carlos Mélo, an exhibition was also held at Sesc Belo Jardim. The works selected were produced over the last fifteen years, and encompassed images and themes that recur throughout the artist’s career. The installation “A Longa Noite” – “The Long Night”, by the artist Lucia Koch, was staged at the Sesc Pompeia between April 7th and July 8th 2018. Conceived specifically to occupy the hall of the theatre, the intervention responds to the architecture of the building and proposes a temporary transformation of the space. A copper-coloured filter covers the enormous glass ceiling of the space, saturating it with a constant violet light that affects our experience of time and space. The artist also introduces hundreds of wooden poles into the space, similar to the structural elements used in the architecture of Lina Bo Bardi. Arranged in apparent disorder, as if awaiting definitive disposal, the poles are painted red, the colour that most stands out against the filter. For its inauguration, she invited the audience to wear red clothes. Adolfo A. Leirner, Alfredo Setubal, Antonio Dias, Clara Gerchman, Elaine Ramos, Evandro Teixeira, Fabiana de Barros, Fabio Cimino, Fulvia Leirner, Gustavo Rebello, Heitor Martins e Fernanda Feitosa, João Avelar, João Sattamini, Lenora de Barros, Licia Viola, Luciana Brito, Orandi Momesso, Luis Antonio de Almeida Braga, Luiz Buarque de Holanda, Marcio Gobbi, Marco Antonio Amaral Rezende, Marta Fadel, Paola Chieregato, Patricia Lee, Patrícia e Waltercio Caldas, Paula Marinho, Paulo Kuczynski, Rara Dias e Verônica Gerchman. “Entre Construção e Apropriação — Antonio Dias, Geraldo de Barros and Rubens Gerchman in the 1960s”,was held at Sesc Pinheiros under the curatorship of João Bandeira. With free entry, the exhibition brought together 60 works by the three artists, conceived between the years 1960 and 1967. The premise of the project emerged from shared aesthetic aspects and social implications in the works of Dias, Barros and Gerchman produced during this period. Under the pressure generated by the turbulent political context of those years — just before the military coup of 1964 and exacerbated by the repression unleashed by the new government — an intense response in the artistic world included major solo shows and collective events, such as the Nova Objetividade Brasileira — New Brazilian Objectivity — (at the Museum of Modern Art at Rio de Janeiro, in 1967), which provided an outlet for a renewed appetite for experimentation. “Making use of the recent constructive legacy and simultaneously appropriating new processes and questions on the agenda at that time, Antonio Dias, Geraldo de Barros and Rubens Gerchman established a poetics with highly specific characteristics. But which, nevertheless, can be approximated in detail, thanks to the skill with which they deal, in their works, with some of the main forces at work in the field of art in the 1960s, and which, though not always in a wholly integrated manner, inform a significant portion of the work which demanded the creation of a new artistic vanguard in Brazil”, observes the curator, João Bandeira. The exhibition Dreaming Awake presented a tropical forest in layers. The humidity, the heat, the sounds and a breath-taking multiplicity of species from the Amazon rainforest are invasive forms where the landscape imposes itself on us. Once inside, there is no way to escape. The pressure of the environment is so powerful and hypnotic that it leaves us in a dream-like state. The project was developed by the curator, Luiza Mello, and the director of Marres, Valentijn Byvanck, in partnership with the artists Dominique Gonzalez-Foerster, Daniel Steegmann Mangrané and Luiz Zerbini. Luiz Zerbini transformed the groundfloor of the Marres into an immersive environment with real plants. Natureza espiritual da realidade — The Spiritual Nature of Reality — , is an almost living picture where we are touched by the humidity, the heat, the smell of the damp earth and decomposing leaves, and where we marvel at the multiplicity of colours and forms carefully positioned in the space by the artist. On mounting the stairs, the visitor comes face to face with new layers of this dreamed forest. In Promenade 2, the French artist Dominique Gonzalez-Foerster invites us to tune out of the external world and experience the sound of a tropical storm. The space is empty; the architecture dissolves so that our attention focuses fully on the sonic environment. Daniel Steegmann Mangrané presents the film Spiral Forest, where a camera rotates through the Atlantic Rainforest creating interconnected movements. The spectator’s body revolves around this continuous spiral and is projected inside the forest, entering into the flow of the image in the moment. The second work, Phantom, is a virtual reality environment where visitors enter and wander through a forest scanned in black and white, using an Oculus Rift. The exhibition Dreaming Awake was held at Marres, Maastricht, Netherlands, between March 10th and June 3rd 2018. Abragames, Akom Studio, Ana Paula D’Arievilo, Álvaro Piquet Pessoa, Gustavo Klein, RING, Théo Buarque de Hollanda, Virtopia, Voxels. To everyone who contributed by sending content. DIGI is a festival of entertainment and reflection built around five pillars: video, audio, games, virtual reality and literature. It was held in the Banco do Brasil Cultural Centre in Rio de Janeiro, on January 18th, 19th and 20th, 2018. Under the general coordination of Eva Doris Rosental, consultancy of Heloisa Buarque de Hollanda and the curatorship of Arthur Protasio (creative director of Fableware Narrative Design) and Henrique Granado (chairman of Jedi Rio), the trans-media event is wide-ranging both in the number of its platforms and its content. 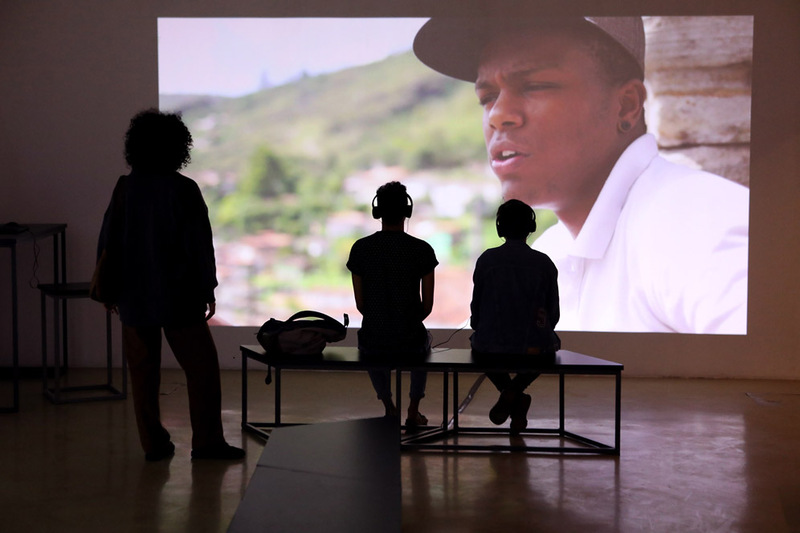 The curatorial focus on Brazilian digital production was reflected in a program where 90% of the attractions were home-grown, including 32 games, 74 videos (about black consciousness, gender and diversity, short films and web series, vlogs and fan-films). There were also 12 debates/lectures, talk shows and shows by Preta-Rara (a rapper, art-educator and creator of the web series “Nossa Voz Ecoa” — “Our Voice Echoes”), the orchestra Ritornello de Jedi (with a repertoire of soundtracks of video game, series and cartoons, for strings and voices) and by the band The Screeners, who present rock versions of the soundtracks of series, games and films. The show Diálogos Ausentes (Absent Dialogues), at the Galpão Bela Maré, in Rio de Janeiro, brought together works by 17 creators and groups which portray the multiple facets of black experiences in Brazil, comprising paintings, installations, photo shoots, short films and records of theatre performances and shows. The project is an initiative of Itaú Cultural, and its pre-production phase included a series of debates about the presence of black people in Brazilian art. Under the curatorship of Diane Lima and Rosana Paulino, the exhibition presented contemporary works by the artists Aline Motta; André Novais Oliveira; Ângelo Flávio; Capulanas Cia de Arte Negra; Dalton Paula; Eneida Sanches; Eustáquio Neves; Fernanda Júlia; Gessica Justino; Herberth Sobral; Juliana Vicente; Larissa Fulana de Tal; NEGR.A Coletivo de Negras Autoras; Renato Felinto; Sérgio Adriano H; Viviane Ferreira; and Yasmin Thainá. According to the curator Rosana Paulino, DiA?logos Ausentes can play an important role (…) regarding the paltry number of works of art produced by Afro-descendents accepted by cultural circuits, and also in reflecting on their use as a tool for discussing the problems faced by this sector of the population and the means for overcoming such obstacles. Conceived specially for the BNDES Cultural Space, Artesania Fotográfica presents the results of the research of seven Brazilian contemporary photographers, who opted to use alternative processes of image printing: daguerreotype, ambrotipia, platinum, cyanotype, albumin and calotype, techniques used from 1839 and practiced until the beginning of the 20th century by amateur and professional photographers. The curator Marcia Mello chose works with a more classical language and also bring current issues of Francisco Moreira da Costa, Cris Bierrenbach, Roger Sassaki, Ailton Silva, Mauro Fainguelernt, Ricardo Hantzchel and Tiago Moraes. The photographer Regina Alvarez (Rio de Janeiro, 1948-2007), pioneer in the use of alternative techniques of photography production and printing in Brazil, is being honored with presentation of documents, personal notes and works of her own.